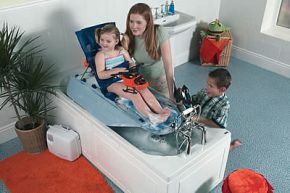 The Mangar Bathlift Surfer Bather For Children. The Mangar Bathlift Surfer Bather is a powered elevating bath lift for children, which minimises moving & handling risks to therapists, parents and carers alike. Operated by low air pressure using the Airflo power source. Elevates and lowers effortlessly at the touch of a button. Backrest angle: From flat to 70 degrees max. Choose from a mains operated Airflow compressor or Battery operated compressor.